1. 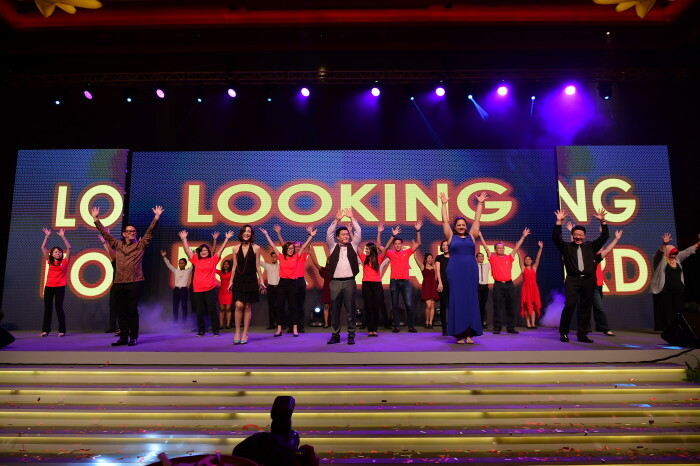 Nurturing human capital – Employers with 2/3rd local manpower and 1/3rd foreign manpower, whereby the Singaporean core comprises young entrants, working mothers, low wage workers, mature workers, mid-career PMETs, glocal talents and more. 2. Developing local talent for senior positions/specialist jobs (e.g. through skills transfer) – Employers to forge stronger complementarity between 2/3 local and 1/3 foreign manpower. Instead of taking in foreign manpower to displace and substitute local manpower, they should use foreign manpower to fulfil three gaps in the local workforce, namely, the number gap, skills gap and timing gap. 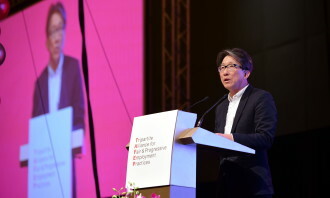 “In other words, instead of 2/3 versus 1/3, we believe that 2/3 and 1/3 is much better,” said Minister for Manpower, Lim Swee Say, announcing the programme. 3. Implementing progressive workplace practices (e.g. 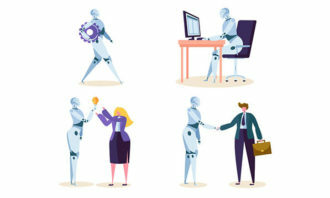 age-friendly or work-life practices which support the employment of older workers and back-to-work women) – Employers to proactively transfer knowhow from foreign PMETs to local PMETs to help upgrade local capability. “So that 2/3 + 1/3 >1,” said Minister Lim. 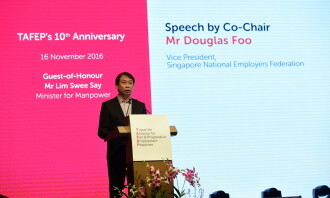 Launched by the Minister for Manpower at the 10th anniversary of the Tripartite Alliance for Fair and Progressive Employment Practices (TAFEP) yesterday, the HCP programme is spearheaded by the tripartite partners, namely MOM, SNEF, and NTUC. 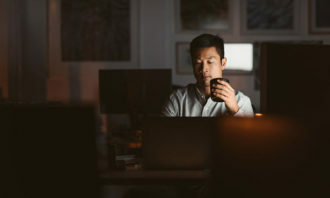 Responsiveness: Quick approvals of work passes and more responsive support, through a dedicated hotline and priority processing for transactions with Ministry for Manpower (MOM). Recognition: Employers will get a HCP mark recognising them as an employer of choice. 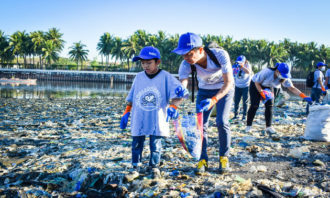 Resources: One stop advisory service provided by TAFEP to better access various assistance grants, such as under Adapt & Grow, SkillsFuture and Lean Enterprise Development initiatives. “Unfair employment practices are bad. Fair is good, but progressive is better. We need to spread the culture and adoption of not just legal and fair employment practices, but progressive and best practices to more workplaces in Singapore,” he said. 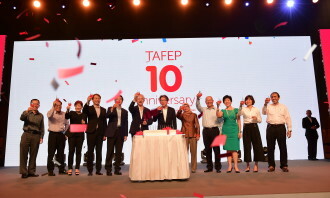 At TAFEP’s 10th anniversary celebration, Human Resources spoke to Minister for Manpower Lim Swee Say during a media interview. “We are starting this HCP as an exclusive community at the beginning,” Minister for Manpower Lim Swee Say told Human Resources. 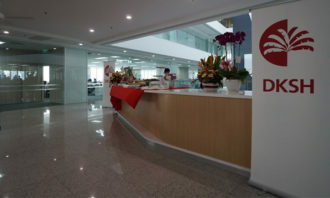 “We will be working closely with the economic agencies, with the sector agencies who have identified the employers who have adopt progressive employment practices and bring them onto the HCP, and over time, we hope that by working closely with them, through their success, through their progress, we will be able to attract even more of what we call the early majority. “They did it because they believed in it and not because of the incentives,” he added. Scroll through the gallery below to check out some photos from the event. 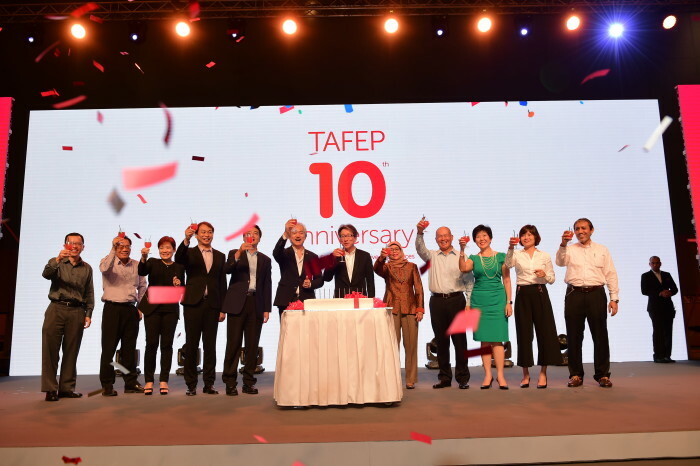 TAFEP’s board members, advisors, and former Co-chairpersons, Mdm Halimah Yacob (5th from right) and Mr Bob Tan (4th from right) raising their glasses in celebration of TAFEP’s 10th anniversary. 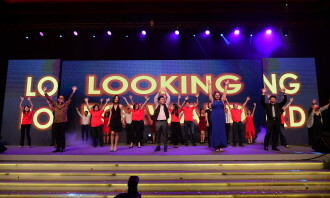 The final dance scene of a musical production on TAFEP’s 10-year journey, starring actress Amy Cheng (front row, in black dress) and produced by singer-composer, Clement Chow. 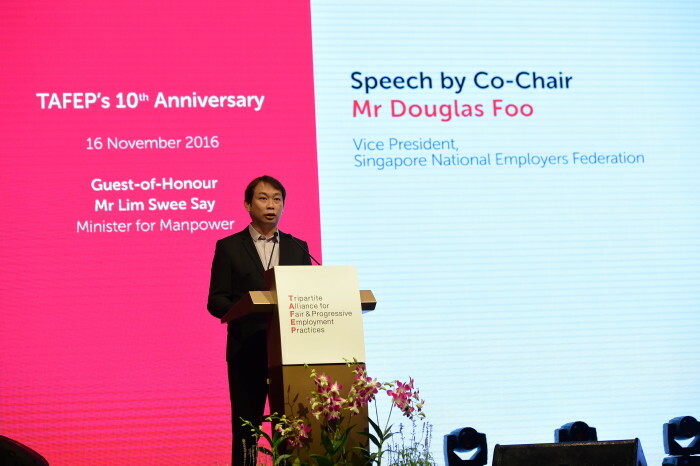 TAFEP Co-chairperson, Mr Douglas Foo, presenting the Welcome Address at TAFEP’s 10th anniversary celebratory event on 16 Nov 2016. 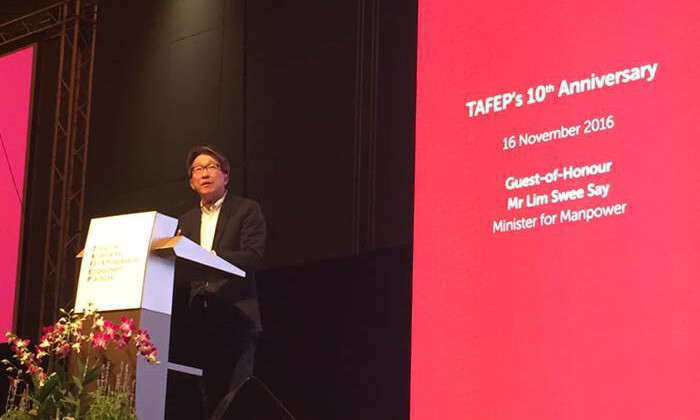 Minister for Manpower, Mr Lim Swee Say, presenting the keynote speech at TAFEP’s 10th anniversary celebratory event on 16 Nov 2016. Regional director Stefan Sawh advises: "Make sure every step of your candidates’ experience is better than that of your competitor..